Though the term k-factor, a measure of the virality of an application, has waned in popularity since Facebook’s sheep-throwing glory days, the idea of spreading a product through referrals lives on. We all know a good referral mechanism when we see one. Dropbox’s invite-a-friend feature which awards free storage for both the inviter and the invited is the canonical example and resulted in torrid growth for the company. In April 2010, Dropbox users sent 2.8M referral emails. It’s these kinds of referrals, those that align the incentives of both parties and ones that are natural to the product, that seem to work the best. But what theory, which frameworks, can help a startup think through the rich mechanisms for creating social sharing features that feel right? I believe it’s social capital. The notion of social capital is a relatively new one. First coined by a Frenchman in the 1890s, social capital reached prominence only 100 years later when economists began to use it as a framework for understanding how people made decisions. They reasoned that it’s impossible to model human decisions’ without understanding the social fabric in which people live. Bonding Capital - used among family and close friends to reinforce existing, close relationships. People with these relationships respect a common hierarchy, contact each other frequently, and share common values. I think bonding capital is the hardest to create online, at least for now, because it deals with our most intimate relationships. Geni and Ancestry, services that enable users to map their family tree, demonstrate the use of bonding capital best. Bridging Capital - used among acquaintances to become closer to people. Facebook leverages bridging capital. When new acquaintances meet, they connect and they seek to increase the frequency of their interactions prim aryl through the news feed to build more mutual bridging capital and ultimately a friendship. 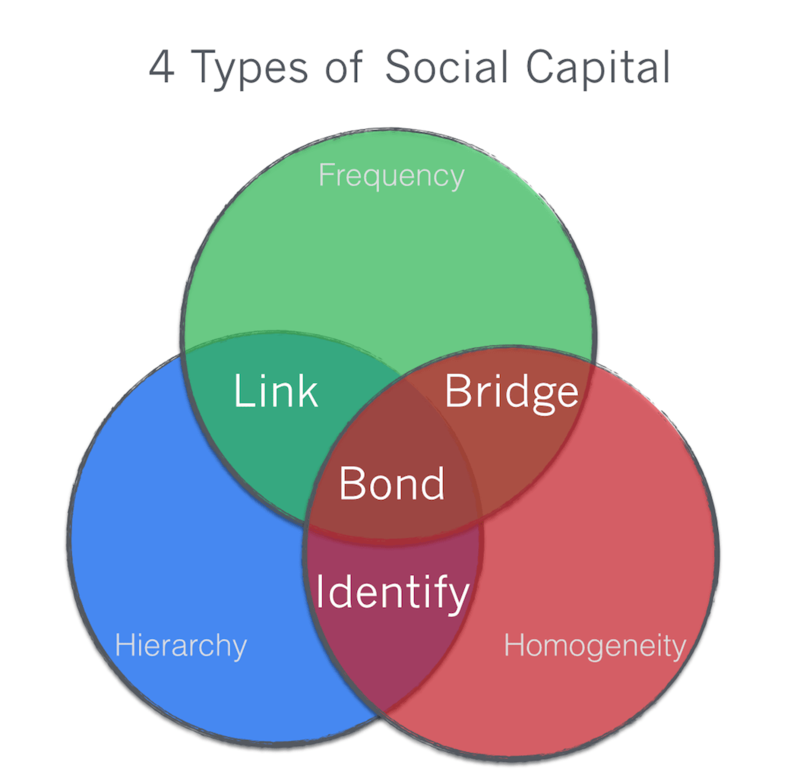 Bridging capital knows no notion of hierarchy within a group. All friends are equal in standing. Instead it relies on homogeneity of the people interacting and increasing frequency of contact. Linking Capital - used among members of voluntary organizations including employees of the same company. Yammer and LinkedIn ask their users to expend linking capital. The hierarchy underpinning the relationships in linking capital is critical to manage, because it can alter the social dynamics quite a bit. At Yammer, asking an employee to share the service with their boss is much more demanding than asking an employee to share with a peer. LinkedIn’s invitation mechanism has the same seniority dynamic at play. Identifying Capital - used among groups with a shared belief, most often political or idealogical. Kickstarter uses identifying capital to grow. One person creates a solution to problem, finds an audience that identifies with the problem and rallies the community to raise the capital to bring the solution to life. Some services may ask users to expend multiple types of capital. At Facebook’s outset, when it restricted friend networks within colleges, users expended bridging capital. As Facebook relaxed those constraints, the new friend behavior emerged, leading to linking capital creation. Now, Facebook can also be a place for people of similar political beliefs to congregate, a place to exchange identifying capital. At its core, creating a successful viral growth mechanism or a referral mechanism for a product means understanding the types of social capital that will be exchanged when one user invites a potential new user. The study of social capital and its applications is still relatively new and novel, but the framework described by Eleonora in her thesis is a valuable tool to design the social interactions and invitation mechanisms of all kinds of products.